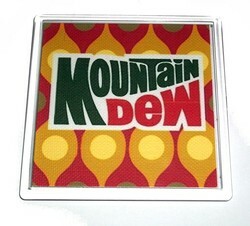 Executive acrylic & canvas coaster and/or change tray featuring 1970s mt. Dew. Sure to be a lasting keepsake. Rich colored high definition image on quality faux canvas and encased in acrylic. The acrylic edging means it instantly matches whatever surface it is placed upon. Perfect for putting under your favorite beverage, keeping loose change in on the dresser or displaying as part of your collection. Limited Edition. The item is 4 inches by 4 inches. Additional individual ones are also available if you need more than one.